For a thousand years her existence has been denied. She is the legend that will not die - Pope Jon, the ninth century woman who disguised herself as a man and rose to become the only female ever to sit on the throne of St. Peter. Now in this riveting novel, Donna Woolfolk Cross paints a sweeping portrait of an unforgettable heroine who struggles against restrictions her soul cannot accept. Brilliant and talented, young Joan rebels against medieval social strictures forbidding women to learn. When her brother is brutally killed during a Viking attack, Joan takes up his cloak - and his identity - and enters the monastery of Fulda. As Brother John Angelicus, Joan distinguishes herself as a great scholar and healer. Eventually, she is drawn to Rome, where she becomes enmeshed in a dangerous web of love, passion, and politics. Triumphing over appalling odds, she finally attains the highest office in Christendom - wielding a power greater than any woman before or since. But such power always comes at a price. In this international best seller, Cross brings the Dark Ages to life in all their brutal splendour and shares the dramatic story of a woman whose strength of vision led her to defy the social restrictions of her day. It was the twenty-eighth day of Wintarmanoth in the year of our Lord 814, the harshest winter in living memory. Thunder sounded, very near, and the child awoke. She moved in the bed, seeing the warmth and comfort of her older brothers' sleeping forms. Then she remembered. Her brothers were gone. 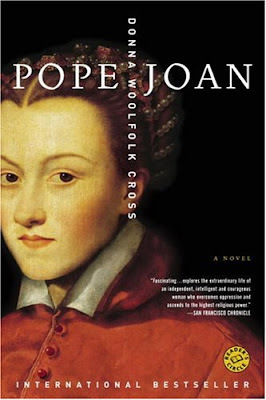 Pope Joan is one of those remarkable novels that evokes images of a spectacular time and period. Pope Joan's achievements, in the face of social oppression against women punishable by death, are remarkable, even in today's world. How a impoverished child, abused, ignored, and trod upon, achieved the greatest throne in Christendom is truly a marvel. But that is not the only reason why this story is so endearing. It is the impeccable research and details into the Dark Ages that makes this novel resound with vibrancy. The novel is rich with intrigue, murderous plots, deadly secrets, adversity, religious zealots, and power mongers. Add to this, a secondary plot of love and loss, and you have a tale that is truly riveting. It is no wonder the novel will soon be made into a major motion picture. why did they use the portrait of elisabeth of austria??? that is silly!!! for a historical based book it is quite an unhistorical thing to do.